Tony Abbott launching his "mini-campaign" just as the heavens open strikes IA's storm hit Queensland-based managing editor, David Donovan, as acutely ironic. 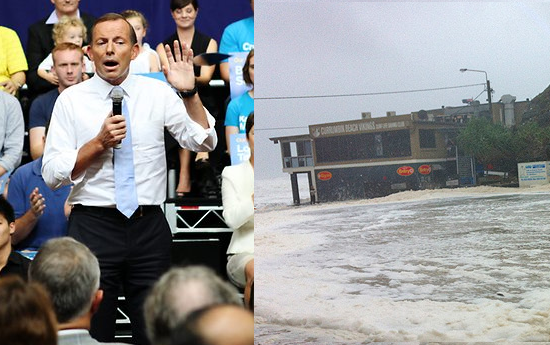 While Abbott pretends to be Barack Obama, the surf inundates a Currumbin (Gold Coast) restaurant. SO, DOES ANYONE else find it rather perverse – or perhaps ironic − that on the day Tony Abbott stood to launch his "mini-campaign", where he declared his intention to repeal the carbon and mining taxes, Queensland and Northern NSW were gripped by – yet another – extreme weather event. This is the Tony Abbott who thinks climate change is crap, or at other times that it might be happening, but that Australia has always had extreme weather events, so relax people — it'll all be cool. No worries! Of course, Australia has always had severe weather events, but they are quite obviously becoming more frequent and they are empirically becoming more extreme. Just in the last month, we've had searing record temperatures, raging bushfires and devastating floods on the Eastern seaboard. Right at this minute, while bushfires rage in Victoria, floods are destroying and taking lives in Bundaberg, Rockhampton and Brisbane (yet again) and other parts of Queensland. And yet, even as this happens, Tony Abbott has the audacity to stand up on a Western Sydney basketball court – like some third-rate Obama – with 300 handpicked suburban Liberal Party groupies, to declare he is going to axe Australia's carbon tax — about the only decent thing Australia is doing right now to try to help mitigate global warming. 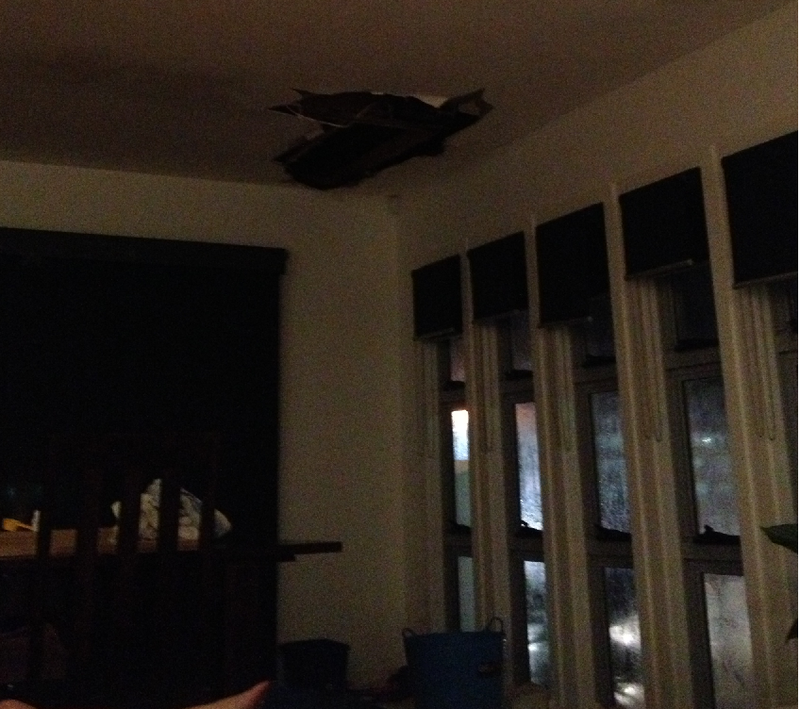 As I sit here in my leaking house in Surfers Paradise, where part of the ceiling has collapsed and buckets and towels line our living room; as the winds howl and rage outside and threaten to take off our roof; and as the sand from the beach threatens to inundate our street, Tony Abbott has never looked – like his stunt – more "mini", nor more absurd. So, he will axe the carbon tax and direct his climate change efforts at "direct action", will he? His budget will be taken up just trying to mop and clean up after extreme weather events. And if his regime is anything like the LNP Governments in Queensland, NSW and Victoria, he will look to reduce spending on essential services by axing jobs in the public services. More than likely, he will try the usual free market scam of outsourcing the provision of essential services to big private corporations – you know, the sort that usually donate heavily to the Liberal Party – who will make these services "user pay". I mean, how else can Abbott heal the $70 billion hole in his budget if he doesn't do this? Apparently, a Liberal Party apparatchik told (former) journalist Michelle Grattan yesterday that Tony Abbott is an alpha male and alpha males are "runners and jumpers". Well, of course, I'd like him to run and jump, but hear me now — he is no alpha male. The thought of this man as a leader is patently ridiculous. An alpha male would lead and take control. 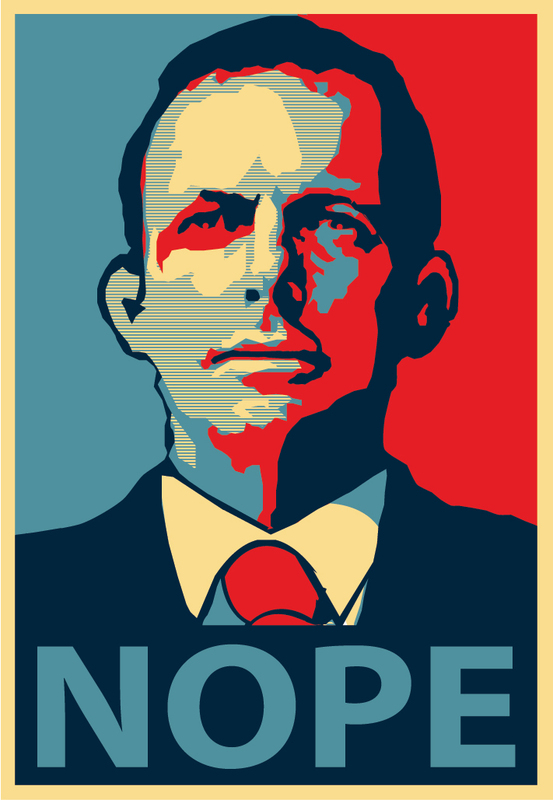 Tony Abbott is not in control. Remember him openly saying in 2007 he was a member of John Howards's "praetorian guard"? He is instinctively a follower — a lackey. The mantle of leadership sits uneasily on him — and the Australian people have seen this, and so they hold him in utter disdain according to every poll of his public approval. Indeed, without constant boosting by the old press, he would have been history long ago. It is no accident that the establishment press back him to the hilt. This is because he is the proxy for big money. He is in the thrall of the same plutocrats — the rich, climate change denying, free market ideologues that control Australia's media and most of the levers of power. You know exactly who they are: Rupert, Gina, Singo, Hughie, and all the shadowy host behind those appalling snake-oil salesmen — the IPA. These are people that don't want action on climate change because, for one thing, it would threaten their profits. But that's not the most important thing; more importantly, they don't want any action because it is a challenge to their delusional egotistical view of the world — that the best way for society to be structured is via some untempered Darwinistic 'let the free market rip' hell-world. You see, in their pampered palaces, this ideology explains why they are rich and others are poor — and why this inequality is not only acceptable, but good. It allows them to see themselves as morally better than other people — for no other reason than they have managed to purloin more wealth. It allows them to ignore the fact they inherited most of it, or have just been lucky, or more ruthless, or more criminally corrupt than other people. And any threat to this convenient ideology is denounced in shrill terms as "Communism" or "socialism" — and that is an outright lie. Trying to preserve the planet, and the lives of humankind, does not make you a "red" or a "leftie" – whatever those terms even mean anymore – it simply makes you a decent, responsible and worthwhile human being. Abbott follows this same ideology – follows it, mind you, he doesn't lead it – and like a good little acolyte, will keep trumpeting it to the heavens all this election year. He will dither and bluster and tie his tongue in knots, more often than not, doing so — even while our precious land and precious planet sears, burns, floods and gets blown away and into things. While people have their houses burnt down, crops dry out, and are swept away in flood waters. And as I sit here with the winds howling outside like a angry monster, wondering where the rain will come into the house next, and wondering whether it will ever end — I realise that Abbott will never be Prime Minister, because Australians are too smart to allow an utter nincompoop to be PM. And if Abbott truly is as devout as he claims, he may pause to reflect on the heavens opening, and the wrath falling from above, on the day of the launch of his latest ridiculous attention-seeking stunt. It is irony on an Almighty scale.